SELECT ONE OF THE 3 BEST GAMES ON THE MARKET!!! Four players enter but only one can win! All players will put on a vest which is connected to a bungee cord and on the opposite side is your opponent. After a simple countdown, boom! All players are off and the first to dunk the basketball on the end will be crowned champion! NEWEST GAME ON THE MARKET!!! THE ONLY INTEREACTIVE INFLATABLE WITH POINT REGISTERING ELECTRONICS. 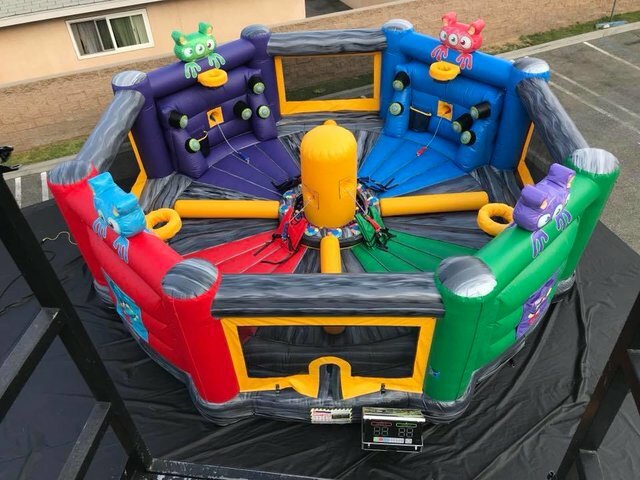 Just like the Tug & Dunk game, 4 players enter the inflatable and are each connected to a bungee cord. During this 4 person tug a war game who ever hits the most lights during the time limit wins!! !